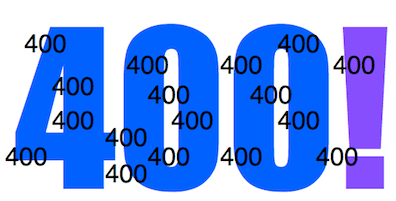 I recently published my 400th blog post. I thought you might want to do something like that yourself. Here’s how I did it, and how you can do it too. If you’ve ever thought “I’d like to make a blog but I don’t know where to start” you are in the right place. THIS is where to start. Look, you don’t write 400 blog posts. You write one blog post, and then you do it again 399 more times. Before you write your first post you need to get your tools in order. Here are tools that I use to create and publish my blog. This article is about Blogger. Let’s look at what happens in the life of a blog post. First, it’s written. Then, it’s published. Third, it’s read (we hope). It might seem that I’m taking things out of order but I’m going to cover publishing first. Publishing can be as simple as pushing a button, but you have to have a place to publish to. You also have to have some sort of a template that makes your blog post look nice on the web, and some sort of system behind the scenes that keeps track of all of your articles– when you wrote them, what they are called, etc. Blogger handles all of that, and it does it all for free. If you’re looking to start your own blog (Tom– ahem) you can do a lot worse than Blogger. I use Blogger and I recommend it highly. Go to blogger.google.com and if you’re asked to sign in, use your Google credentials. Click the “New Blog” button to create a new blog. Then title it, choose an address, pick a template, and you’re ready to go. Note that all Blogger blogs have addresses like “something.blogspot.com” where you get to pick the “something” part, and yes, “something.blogger.com” would make more sense but that’s not up to us. Don’t worry about choosing the right template– you can change your mind later, even after you’ve written a lot of posts. Anyhow, give your blog a title, give it an address, and choose a template. Then click the “Create blog!” button at bottom right. Congratulations– you now have a blog! There’s nothing in your blog, but you have one. Now you can change your blog’s look by trying out various templates. You’ll find customization options within each template, so if you find a template that is close to what you want, but not perfect, you may be able to customize it to be just the way you want it. Here are some templates applied to the same blog. Completely different looks, at the click of a mouse. The screenshots show you that Blogger gives you customization options. As you can see, Blogger takes care of making your blog look nice on mobile devices like iPhones as well as on larger screens such as on laptops and desktops. That’s a major plus because a lot of people are going to read your blog on their phones. It’s just the way it is these days and it’s not practical to simply squish your full-size blog onto an iPhone’s screen. You need a layout created especially for the smaller screen size. Blogger, by some miracle, can tell how your blog is being read– that is, on an iPhone or on something larger– and will deliver the proper version automatically. You can write your blog posts (articles) right there in Blogger (look for buttons to create a new post, to save, and most importantly to publish), so technically you’re ready to blog. (I’m going to tell you about a better way to do it in Part 2 of this series.) Write, format, and publish– and then send me an email telling me about it. I’ll check it out, I promise. Remember, a blog needs software (something to write posts with, something to format the layout with, and something to keep it organized behind the scenes) and a web host (to store the posts and make them available to the world). Blogger handles both parts, so you only have to deal with one outfit– Google– (and you probably already have the account). That makes it simple. Lots of people use software called WordPress, and there’s nothing wrong with that. If you go to WordPress.com, you can create an account and then a blog, for free. You edit your posts within a browser using WordPress’ own software; the software can be disorienting, but it works. Confusingly, there is also something called WordPress.org. WordPress.org is just software, and you install it onto a web host. If you remember that WordPress.com is software and hosting combined, and that WordPress.org is just software, you’re doing fine. (You may wonder why you would choose WordPress.org, considering you get free hosting with WordPress.com. The answer is “flexibility.” WordPress.com limits what you can do with their software if you are hosting with them. Another reason to NOT use WordPress.com might be “because I don’t want my website to advertise WordPress’ name.”) If you go with WordPress.org you have to arrange web hosting with a hosting company. For the price it is hard to beat FatCow’s hosting plans. You can get started for just a few dollars, and they have a 30-day money back guarantee so if you change your mind, you’re out no money at all. Once you have a web host, you have to install WordPress. This is usually a one- or two-click process. WordPress is more flexible than Blogger, has more templates, and has more plug-ins. It’s also wildly popular so if you choose WordPress you’ll have no shortage of places to turn for help. For me, though, a system that let me jump right in and start writing and publishing– a simple system– was better than a fancy one that might take some time to learn. Web hosting isn’t expensive but free is even better. I can’t prove this but I do believe that Google does an extra-good job of indexing the things I publish to Blogger. Roughly 80% of all visits to my blog come from a Google search, and even though it’s a big world out there with lots and lots of articles, somehow mine keep showing up high in the rankings. Search Google for “How to stretch battery life on iPhone” and you find 940,000 articles… and mine is 5th on the list. Out of 940,000! That’s just wild. Search for “How to make your Mac read out loud” and you find 3 million articles on that topic… and mine is 9th on that list. Search for “How to add storage space to MacBook Air” and you find 40 million articles… and mine is 15th. I like to think that some of this has to do with my posts being high-quality and interesting and somehow noteworthy. Maybe they are; I try hard. But I think that Google is paying a little extra attention to the blogs that are published on the platform Google itself owns. It just makes sense that they would. I assure you that I use no search engine optimization tricks and I don’t advertise at all. For the reasons above– simple, free and Google– I chose Blogger for my blog, and I recommend you use it too. UPDATE: I created a new blog using WordPress.org software in order to know more about it. The blog is called “One-Minute Macman” and it’s meant to be a speedy read. I publish every day. Check it out! You– yes, YOU– can make a blog. Why not do it right now– I’ve given you all you need to know, and if you go with Blogger it won’t cost you a dime. Like so many things, the hardest part about making a blog is taking the first step. After reading this article you should be ready to take it. Next installment: recommended tools for making your blogging easier and more convenient.